US Air Force/Staff Sgt. Christopher RuanoStaff Sgt. 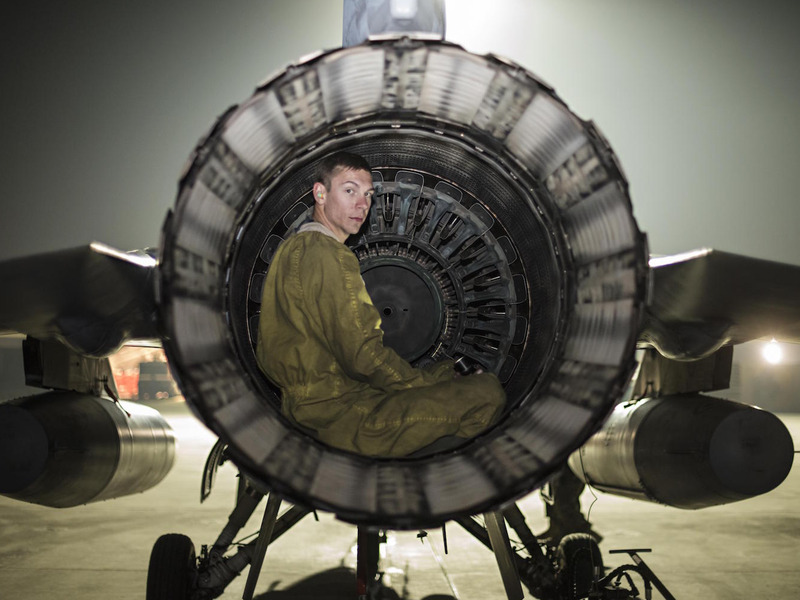 Ryan Anderson, a crew chief with to the 480th Expeditionary Fighter Squadron, does preflight checks on an F-16 at Souda Bay, Greece, January 27, 2016. But getting those maintainers trained is another process – one that can’t be rushed. The Air Force has been struggling for years to correct its pilot shortage, but it has also been dealing with a protracted shortfall of maintainers – the airmen who keep planes flight worthy. Although the force has significantly reduced its maintainer shortage, it now faces the daunting task of training the new recruits up to the levels of knowledge and experience the force needs. That takes considerable time. 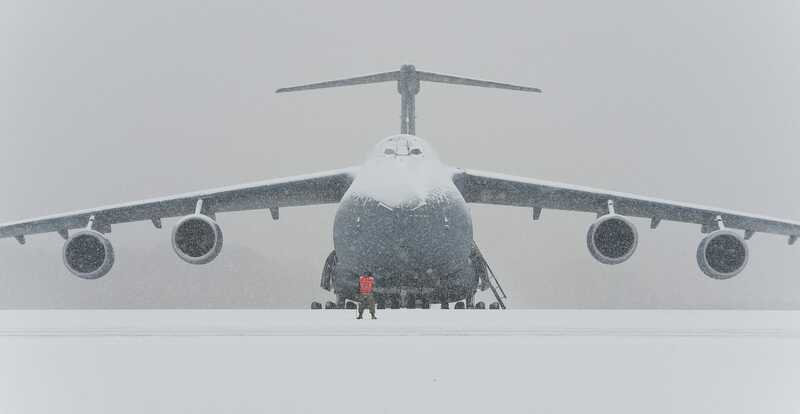 Flickr/US Air ForceAn aircraft maintainer on the flight line in front of a snow-covered C-5M Super Galaxy, at Dover Air Force Base, Delaware, January 6, 2015. The shortages fell especially hard on the most experienced airmen – 1,900 maintainers at the 5- and 7-skill levels were absent. 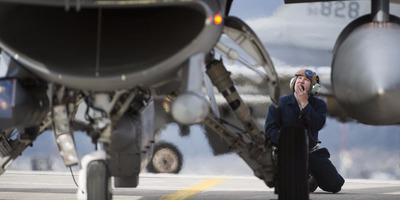 Maintainers at that level work on the Air Force’s advanced aircraft, like the F-35, and those with the most experience were left working 50- to 60-hour weeks to keep aircraft in flying shape. The force rolled out a number of enticements to keep airmen on the flight line. By the end of fiscal year 2016, that shortage shrunk to 3,400 maintainers. By the end of fiscal year 2017, the official tally was down to 400. US Air Force/Staff Sgt. Katherine SpessaSenior Airman Daniel Lasal performs a post-flight inspection on an F-16 at Bagram Airfield, Afghanistan, November 15, 2016. “So we’ve been getting well” in terms of maintainers, Air Force Secretary Heather Wilson said at a Heritage Foundation event last week. Wilson said in mid-February that the shortage had fallen to 200 maintainers – though Air Force spokeswoman Erika Yepsen told Business Insider the number can change throughout the year based on the force’s personnel numbers and needs. Wilson added at the Heritage Foundation that simply adding airmen won’t solve the problem created by shedding experienced maintainers. “There’s only so much you can do to really learn and master your craft, but we’re almost well in terms of numbers, really now it’s about seasoning that force and getting them to the level of being craftsmen,” she added. To help accelerate training, the Air Force is going to the boneyard – the aircraft storage facility at Davis-Monthan Air Force Base in Arizona. The boneyard (there is more than one) provides long-term storage for mothballed or unused aircraft – the force has scavenged parts from there to keep its largest plane, the C5 Galaxy, in the air. U.S. Air ForceStaff Sgt. 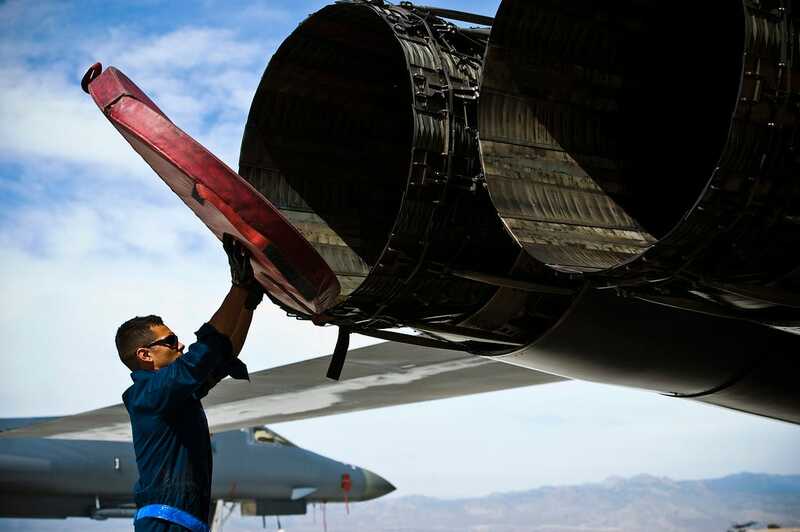 Kevin Colon removes exhaust covers from a B-1B Lancer at Nellis Air Force Base, Nevada, May 21, 2013. According to Air Force Times, the force will start pulling F-15s and F-16s from the facility to provide training aircraft for the new maintainers and weapons-loaders. Those planes won’t fly, but they will act as high-tech guinea pigs for aircrews training to work on active combat aircraft. This will also keep the Air Force from having to take active aircraft out of service for training. The Air Force has also brought in civilian contractors to take over some responsibilities – like washing aircraft and instruction – to free up time for maintainers to train. “Every jet that I can relieve and put back on a flying schedule instead of being a ground instructional trainer, that has second- and third-order return on investment,” Col. Michael Lawrence, head of the Air Force’s maintenance division, told Air Force Times in December.